BURLINGTON, N.C. – A group of students from Burlington Christian Academy will challenge the staff of National Agents Alliance in an exercise called the “Hat Factory” during a Leadership Millennium class taught by Alamance Community College on Thursday morning at NAA’s office on Maple Avenue. 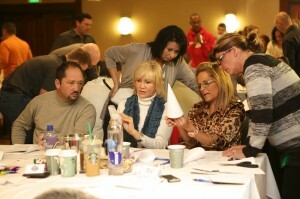 The Hat Factory is a team building game designed to test participants in a number of leadership areas. The students will form one team, while the NAA staff will break up into several teams and compete against each other. Each participant will learn a specific skill that will be their job during the game. Each team will learn how to cut, fold and assemble three different styles of hats – sailor, drummer boy and princess – in four different colors, but the groups also have order fulfillment, quality control and several other variables. Playing time simulates five weekdays and a Saturday, each day being four minutes of playing time. The week will run from Wednesday to the following Tuesday, with an option to work overtime on Saturday if they desire. The teams are given 45 minutes to study orders, cut them apart, plan production runs, schedule resources and learn how to assemble each type of hat. There are other variables thrown at teams during the work week that players are not aware of until informed. Jeff Bright, Assistant to the ACC President and the director of the Leadership Millennium class, said you can learn a lot about the type of people you work with during the exercise.